It was a surprise to everyone to find the water level down by a good three feet, despite the heavy rain of the past week. It was noted that a pump running at the far end may have been feeding the field of sweet corn, but this wasn’t confirmed. Nevertheless, Trevor enthusiastically pegged the required 14 swims, not forgetting any this time, and prayed that he wouldn’t draw ‘The Point’ as it was now more like a beach with no more than 12” of water for as far as you could cast! 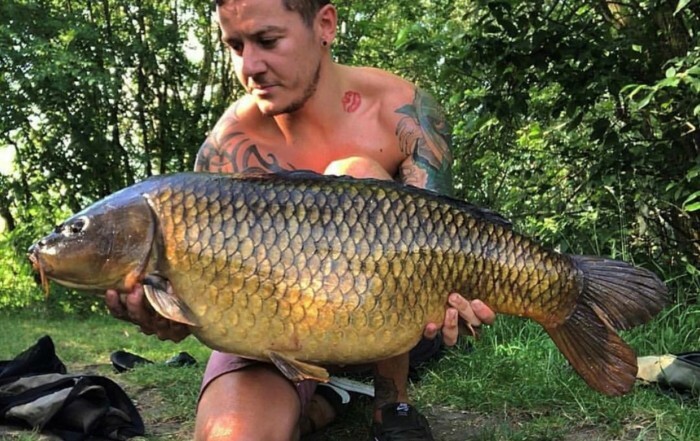 Dave Lindsay made a surprise appearance after a match absence of 10 years and showed he hadn’t forgotten how to do it by winning with three carp for a respectable 23 lb. He did however realise that some of his gear was even older than him when his landing net handle and also his landing net broke, and his reel back wound to tangle the line. Not giving up this left him waste deep in the water, holding just the broken net and retrieving line through his fingers as though he were fly fishing, I did ask that he keep the noise down as the whole lake woke up to his waves and splintering noises! Nevertheless, after a further 10 minutes he managed to net the double figure carp and continue to catch another two. Trevor of course did draw The Beach and sitting visible to the whole lake was clearly heard talking to himself about his misfortune as he laid out his keep net horizontally and could not even ½ submerge the rings! At the weigh in, when he had been seen swinging in a fish a cast, he estimated that he had 2 – 3 lb in the net, which turned out to be 13 lb+, seems he must have been too long with Ian Darler! 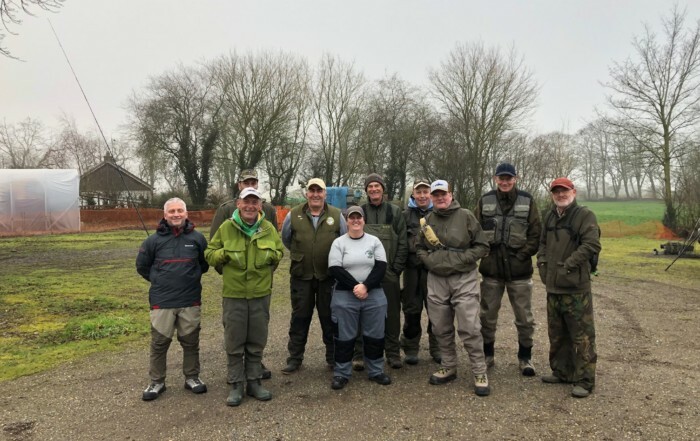 Ken managed over 16 lb of rudd/roach from the far bank to finish second, with Adam doing his best to keep up with a decent 12 lb which gave him sixth. Gwyn, also on the far bank, was unlucky to loose four carp but managed to avoid disaster with over 9 lb of rudd. The Mepal Marvel had done really well during earlier practice sessions, landing several carp to 20 lb and 5 lb plus bream but on the day his luck was elsewhere and he DNW, I’m sure he’ll be back! 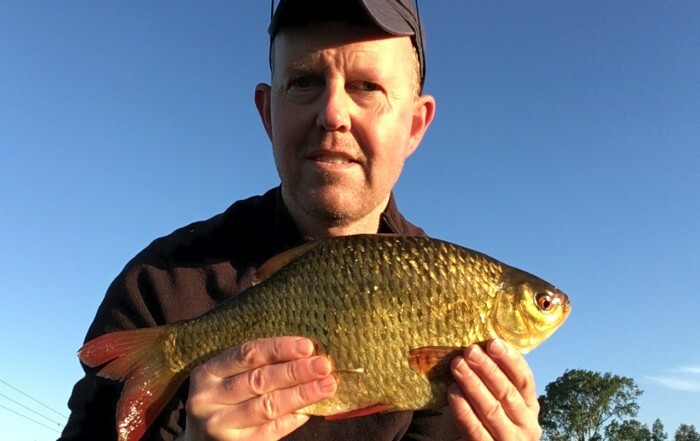 The rest of us settled for varying nets of rudd/roach to 14 lb+ with a few small bonus tench to around a pound, which gladly seem to be showing regularly. Total weight was close to 150 lb, not bad when we thought it might not fish because of the v low water level. Our next match on 2nd September will be on The Cam downstream of the railway bridge at Chesterton. This can be a fantastic stretch but also surprisingly slow, there have been some very good recent catches so let’s hope the form continues and that the bream and tench stay hungry. For those not familiar with this stretch of The Cam you should park in Fen Road just past where The Pike & Eel used to be (now flats) and either walk downstream along the river or if you’re further towards the road bridge over the railway find the narrow walk way through a pinch gate to the river (about 200 yds before the road goes over the railway), the railway bridge over The Cam is visible 100 yds downstream, which is where we’ll draw. As usual please book your place via Trevor, details as per the club book.